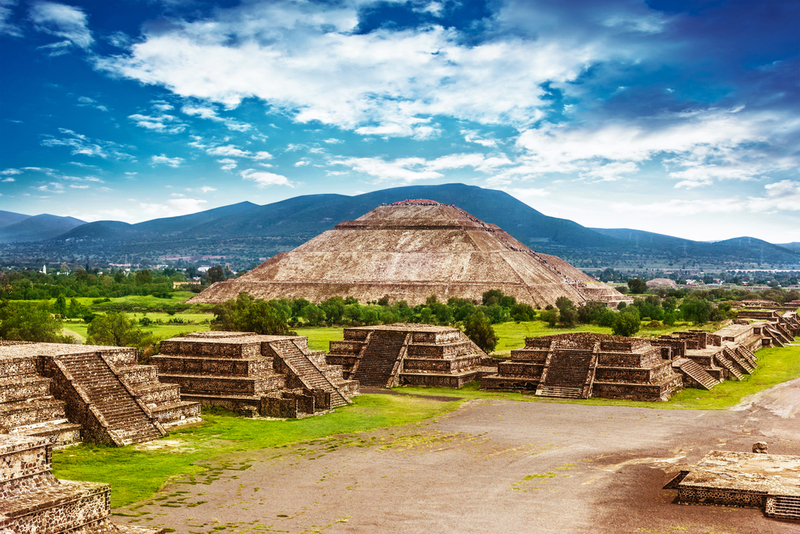 Shrouded in mystery, a place that experts all over the world are trying to understand, Teotihuacan is one of Mexico’s largest, and definitely its most mysterious, archaeological sites. With the third largest pyramid in the world being found here, a visit to this fascinating land mark is a trip not to be missed. Teotihuacan was the cosmopolitan hub of Mesoamerica, from 100 BC until its collapse, over a thousand years later, in 550 AD. At it’s peak this mysterious city housed a population of over 200,000 people. Unlike most other famous archeological sites in Mexico, this one was not built by the Aztecs or the Mayans, in fact the race of it’s creators, and initial inhabitants is still unknown. There is still widespread debate between experts as to the original ethnic group, or language they spoke, and so they begun to call them Teotihuacanos. There are many theories as to how the majestic city of Teotihuacan was initially built; one is that an erupting volcano forced a wave of immigrants into the Teotihuacan valley, where they sought refuge and eventually built or bolstered the city. Another theory is that the Toltec race was responsible, however multiple scholars have pointed out that the Toltec population peaked long after the Teotihuacan zenith, and therefore they believe it was the Totonac race. One thing all experts can agree on, is that this city was built thousands of years before the Nahuatl speaking Aztecs arrive in central Mexico, meaning they had no hand in it’s creation. They did however, give it it’s name – Teotihuacan, meaning ‘place of the gods’, and have since made many renovations, in some places covering the original buildings and sculptures with their own. The mystery shrouding Teotihuacan and it’s awe-striking pyramids are what gives it it’s charm, attracting thousands of visitors daily. Pyramid of the Sun. Photo credit: Shutterstock. At 70m high, and over 215m wide, this is the largest of all the Pyramids in Teotihuacan, and the second largest in the whole of Mesoamerica. This dwarfing structure was built in two stages; the first stage, completed in 100 BC, brought the structure almost up to the size we see today, and the second round of construction, finished in 200 AD, took it to an enormous 225m high. However, it’s not just the size of this Pyramid that is so impressive, excavations in 1971 revealed a large tunnel, running 20 feet below the base, that opened up into a set of chambers in a four leaf clover formation. It is thought that these chambers were used for ancient fire and water rituals, and may have even been a burial place for the emperor himself. 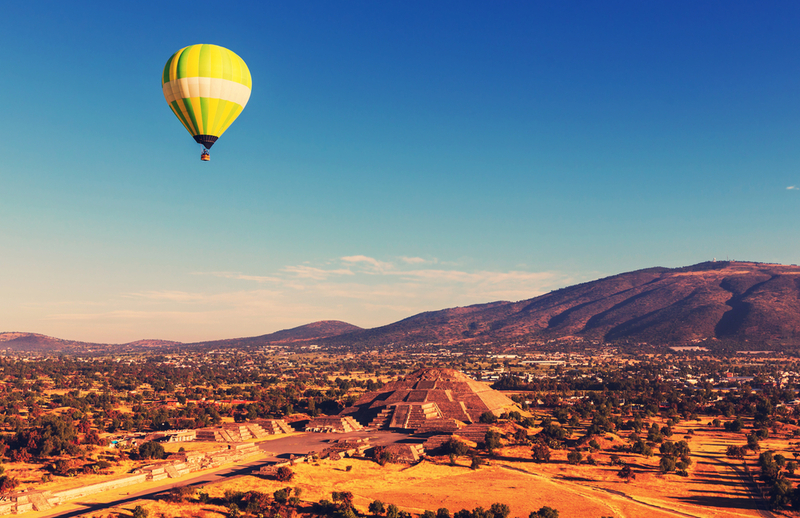 Many Mexicans believe that the Pyramid of the sun holds astrological powers, and on March 21st (Spring Equinox) people travel from all over the country to climb the gigantic structure, and charge their energies at the top. Many scholars have also looked into these properties, stating that the pyramids here echo the shape of the mountains in the valley, however nothing of this kind has ben proven. Pyramid of the Moon. Photo credit: Shutterstock. This Pyramid is the northern most landmark of Teotihuacan, and is believed to be the starting point of the city’s layout. This structure was completed slightly after the Pyramid of the Sun, in 250 AD, and stands at 43m high, making it the second largest in Teotihuacan. The most fascinating thing about the Pyramid of the Moon is that it was built in seven layers, one pyramid on top of the other, very much like a Russian doll. Excavations have revealed human sacrifices in at least the last 3 layers, most sat upright in the lotus position, accompanied by animal sacrifices and objects made of Obsidian and Greenstone. The stairs of the Pyramid of the Moon are much steeper than those of the Pyramid of the Sun, so be prepared for a very strenuous climb. 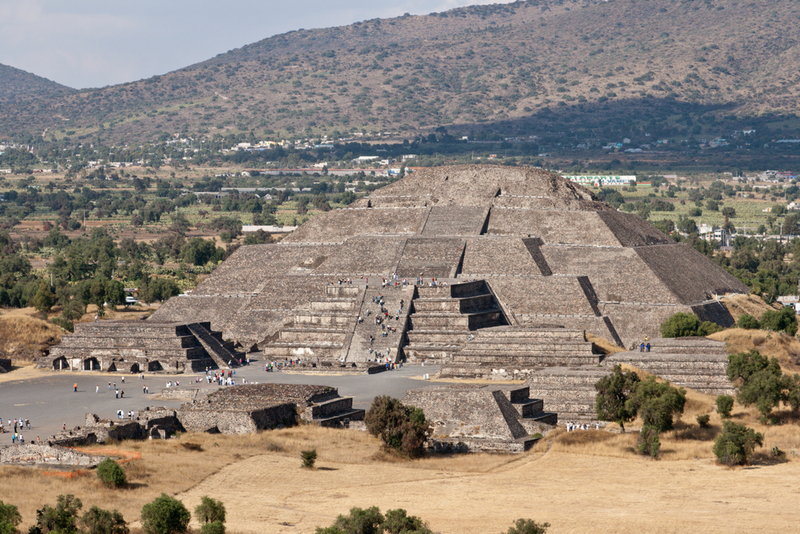 Although visitors can only climb to the fifth level of the structure, at it’s peak there is a platform where ancient ceremonies were carried out in honour of the Great Goddess of Teotihuacan, the goddess of water, earth, fertility and creation. The main slope of the pyramid opens up to the Plaza of the Moon, which is surrounded by twelve smaller platforms and pyramids, the largest being the Temple of the Feathered Serpent. Temple of the Feathered Serpent . Photo credit: Shutterstock. Until very recently this structure was known as the Temple of Quetzalcoatl, this is the name of a very similar looking Aztec god which came thousands of years after the Teotihuacanos. Experts however, uncovered the original structure, dating back to 200 AD underneath the renovations the Aztecs made, and found sculptures of a feathered serpent deity lining the pyramids sides, thus the name was changed to the Temple of the Feathered Serpent. Spanish explorers noted the building as having a conical roof, made to look like a coiled snake, and an entrance arch in the shape of a snakes mouth, complete with fangs. Spaniards at this time associated any imagery of snakes with evil, because of the story of the Garden of Eden, and so most likely destroyed it. However, if the arch fell from natural causes then it is very likely still buried behind the structure, just waiting to be discovered. 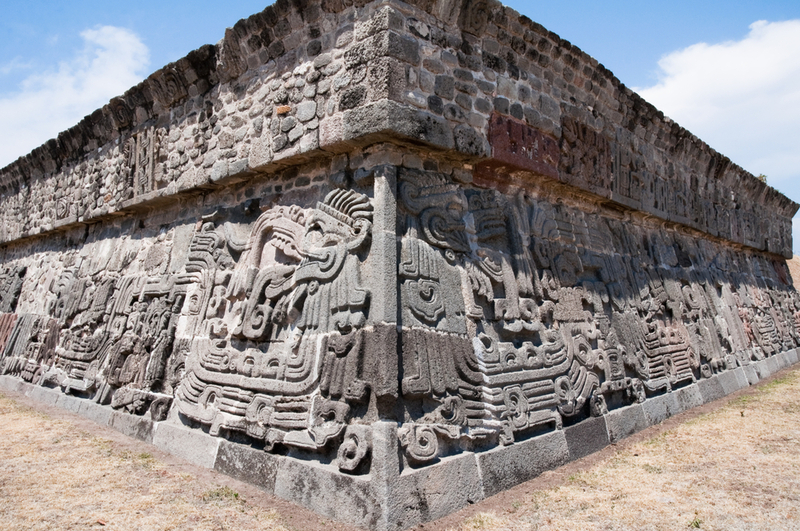 Found on the South West corner of the Moon Plaza, is the finest and most elegant building in Teotihuacan, the Palace of Quetzalpapalotl. This stunning stepped structure was built in 250 AD, complete with complex paintings, stone carvings and delicately painted roof ornaments. When originally excavated this structure was thought to be the residence of a high priest or dignitary, as the columns surrounding the palace were covered in ornately carved images of Quetzalpapalotl, a mythical creature combining a bird and a butterfly, widely adored throughout the Mesoamerican cultures. However, recent research has identified the images on the columns to be of the Teotihuacano owl. The repeated use of owl iconography is known to represent the Teotihuacano warriors, priests and socially elite, and so it is thought that the palace was actually built to be a meeting place for members of a new political movement in Teotihuacan. Avenue of the Dead. Photo credit: Shutterstock. This is the main road running all the way through the centre of Teoticuacan, from the Moon Plaza, past the Pyramid of the Sun, and onto the Citadel of this grand city. The road is just over a mile and a half long, and in ancient times is said to have had a river running along the sides, providing the whole city with water. From atop any of the large structures in Teotihuacan, it is clear to see that the Avenue of the dead is the backbone of the entire city, connecting all it’s beautiful structures. The archeological site of Teotihuacan can be found 50km (30 miles) north of Mexico City, making it the perfect spot for a day trip. There are several entrances to the site and which one you pick will depend on the amount of time you wish to spend exploring the Pyramids. If you have a full day, and wish to explore the whole site, then take the first entrance, Puerta 1, and begin your journey at the Museum. From there you can visit the Citadel, Temple of Quetzalcoatl, and then take a walk down the Avenue of the Dead to the main Pyramids and the Moon Plaza. 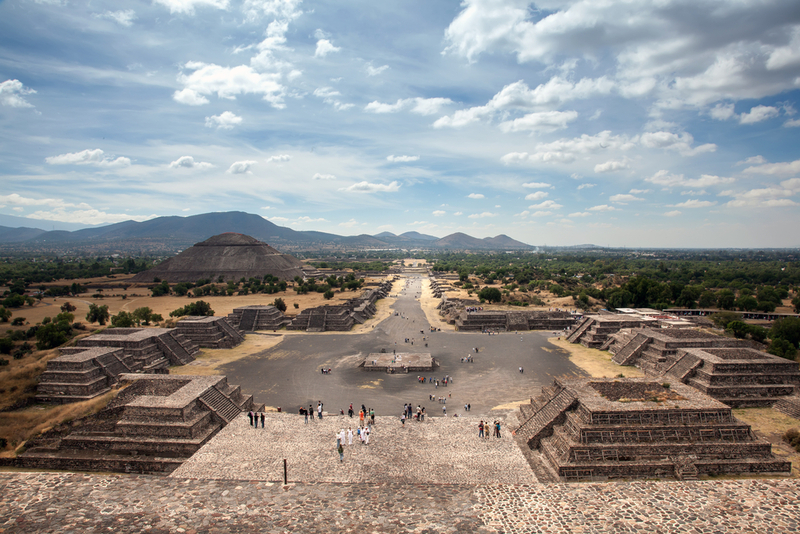 If you only have time for a short stop off in the Teotihuacan site, we suggest taking either the second or third entrance, Puerta 2 or 3, which will lead you straight to the Pyramid of the Sun and then left to the Moon Plaza and Pyramid of the Moon. Chimu Adventures can help you organise your perfect trip to Teotihuacan and all the other highlights Mexico and South America has to offer. Click here for more information.